Hyatt Hotels Corporation is a global hospitality company with widely recognized, industry leading brands and a tradition of innovation and service. Recently, Hyatt turned to StrandVision Digital Signage to efficiently communicate with associates throughout their workdays, no matter when they are working or where they are on the properties. Elan Drug Technologies targets messages to its 150 employees over multiple shifts in its break room and in the gowning area. The Rotary Club of Ancaster is making innovative use of StrandVision Digital Signage technology. 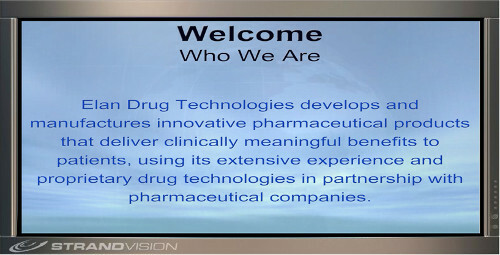 It is using the StrandVision portal to drive an Online TV on its website.